Cellular therapies hold great promise for curing or treating diseases and for healing damaged tissues. The therapeutic cells for treatments are often generated using growth factors or cytokines to drive differentiation from either stem cells or immature immune system cells. In recent years, stem cell researchers and immunologists have made exciting discoveries that are now being or will soon be tested in clinical trials. However, researchers can do better in minimizing the effort of translating research discoveries from the laboratory to the clinic. Research scientists now have the option of utilizing authentic recombinant human proteins (growth factors and cytokines) that also have the added benefit of streamlining future clinical translation efforts. HumanKine® proteins from HumanZyme are manufactured using the human gene expressed in the human cell containing the complete cellular machinery needed to process, fold, and post-translationally modify the protein into an authentic, native human molecule. For many proteins, other widely used production systems, such as bacteria, insect cells, and even other mammalian cells, simply cannot make a protein that is as authentic as the native human version. Such authenticity includes structural aspects such as glycosylation, proteolytic processing for mature protein formation, disulfide bond formation, and folding into the proper three-dimensional shape, as well as subsequent chemical and biological differences such as resistance to proteases, binding affinities, isoelectric point, and biological activity. Therefore, an authentic human protein is not only defined by its amino acid sequence but also by human cell facilitated modifications and processes that are necessary to create a biologically relevant molecule specifically designed to work in the context of a human system. The growth factors and cytokines used to manufacture therapeutic cells are essentially signals that direct the cellular differentiation as well as expansion. Clearly, scientists who use the authentic human signal for their cells could very well achieve an improved outcome. In one example, scientists who were differentiating dendritic cells (DCs) from peripheral blood mononuclear cells switched from a routine protocol using E. coli-expressed GM-CSF and IL-4 (G4) to a new protocol using HumanKine G4. In addition to switching to the authentic human cytokines that are glycosylated, the researchers reduced the cytokine concentration by 90% and eliminated the 50% medium exchange steps on day three and day five of the seven day protocol. These concentration and medium-exchange protocol changes were not effective in generating mature DCs with the E. coli-expressed G4 (data not shown); therefore, the protocol comparison used 10-fold less cytokines for the HumanKine G4 than for the E. coli-expressed G4. Figure 1. Overlay histograms of the expression of various surface markers by DCs generated and matured under different conditions. Filled blue: isotype matched control. Open red: 24 hr sham treatment. Open green: 24 hr LPS treatment. Mature DCs not only express elevated levels of certain cell surface markers but also exhibit upregulation of certain chemokines and cytokines. Both protocols demonstrated similar increases in CD80, CD83, and CD86 as well as the MHC molecules HLA-ABC and HLA-DR (Figure 1) when comparing LPS-induced DC maturation versus a sham treatment. In addition, both protocols showed the expected increases (LPS treatment versus sham treatment) in a relevant panel of chemokines and cytokines (Figure 2). 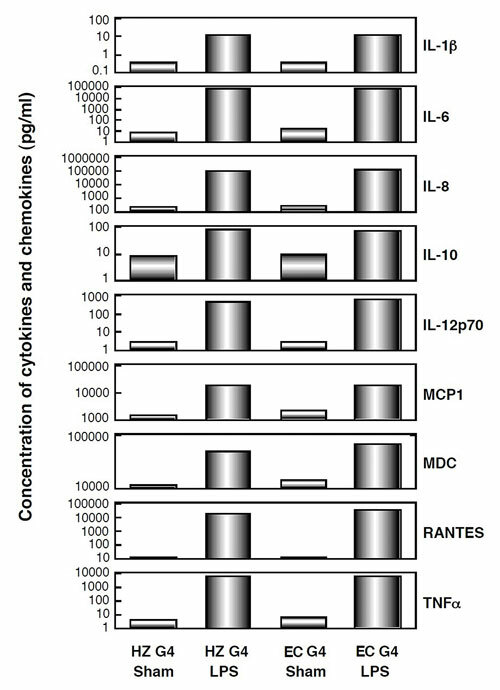 Upregulation of these surface markers, cytokines, and chemokines are consistent with properties exhibited by mature DCs. To test whether the protocols generate functional mature DCs, the cells were assayed for their antigen-uptake capacity and their antigen-presentation capacity. Antigen uptake capacity was determined by measuring phagocytosis of FITC-dextran at 0.2 mg/mL by flow cytometry. For each protocol, the experiment included DCs matured with or without LPS for 24 hours. The LPS-induced matured DCs showed similar increased fluorescence uptake over sham matured DCs for both protocols (Figure 3A), showing that both protocols are effectively generating mature DCs. Figure 2. Concentration of cytokines and chemokines (pg/mL): Production of selected cytokines and chemokines by DCs generated and matured under different conditions. Measurements were done using the Pierce Cytokine Assay. To determine antigen-presenting capacity, DCs differentiated in the presence of HumanKine cytokines or E. coli-expressed cytokines before or after LPS maturation were cultured in triplicate with allogeneic human peripheral blood T cells at various ratios for five days. The cultures were pulsed with 3H-TdR (0.5 uCi/well) for the last 18 hours before cell harvest. The proliferation of T lymphocytes was measured by beta scintillation counting. 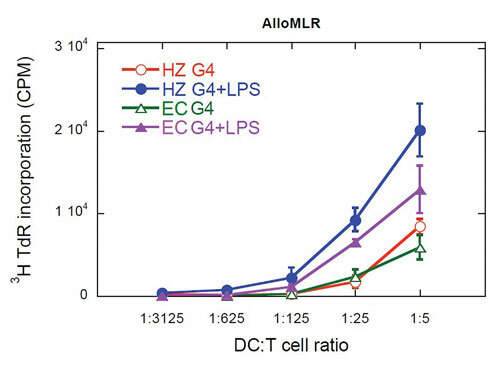 As shown by Figure 3B, DCs differentiated in the presence of either HumanKine G4 or E. coli-derived G4 showed similar low capacities to stimulate the proliferation of allogeneic T cells, in particular when the DC:T ratio was low. However, after LPS-induced maturation, DCs differentiated under both conditions increased their capacity to stimulate the proliferation of allogeneic T cells. 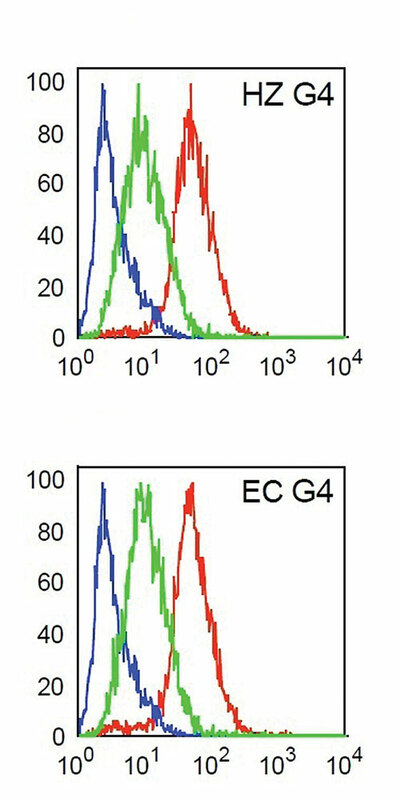 DCs generated in the presence of the HumanKine G4, however, performed significantly better than DCs generated in the presence of E. coli-expressed G4 in this regard (Figure 3B). The improved performance of the DCs using the protocol with HumanKine G4 may be either directly due to enhanced stability and half-life properties of the glycosylated cytokines and/or to indirect factors related to an uninterrupted seven-day incubation versus the two medium changes required using the original protocol. In either case, the new protocol offers the additional benefits of fewer hands-on steps, a lower chance of cell culture contamination, and a method that is better suited to industrial scale-up. Figure 3A. Phagocytosis of FITC-dextran by DCs generated and matured under various conditions.Blue: FITC-dextran uptake by DCs after 1 hr at 4°C. Red: FITC-dextran uptake by sham-treated DCs after 1 hr at 37°C. Green: FITC-dextran uptake by LPS-treated DCs after 1 hr at 37°C. Because HumanKine proteins have the same properties as native human proteins, their use can lead to better experimental results and protocols when directed at applications that involve human cells. In addition, once research-stage cell therapy projects are ready to advance to the clinic, HumanKine growth factors and cytokines offer a number of advantages that are often overlooked by basic researchers. These advantages include safety, scalability, adaptability to cGMP production, and lot-to-lot consistency, which are important for regulatory, manufacturing, and/or supply chain purposes. Ancillary materials, such as growth factors, that come into contact with cells that will be used therapeutically must not carry the risk of transmitting adventitious agents. Also, nonhuman glycan structures found in other mammalian expression systems may cause immunogenicity in human applications. HumanKine proteins are manufactured without any animal-derived components or cells, an important prerequisite for materials used in a clinical setting. Furthermore, all components and supplies used in production are well defined and readily available providing the assurance that an uninterrupted supply can be maintained. A genetically scalable, stabile suspension culture production system enables adaption to cGMP manufacturing and consistent lot-to-lot performance. Figure 3B. Allogenic MLR of DCs generated and matured under various conditions. Red: DCs generated with HumanKine G4. Blue: DCs generated with HumanKine G4 and LPS maturation. Green: DCs generated with E. coli G4. Purple: DCs generated with E. coli G4 and LPS maturation. Soon Jeong, Ph.D., is director, research and development, Zhenbiao Xia, M.D., is senior scientist, and Christian A. Heid (cheid@humanzyme.com) is vp marketing at HumanZyme.